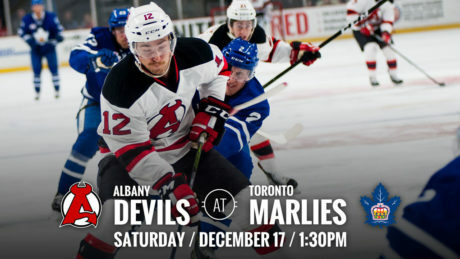 The Devils travel to Toronto to take on the Marlies with back-to-back games, Saturday at 1:30 pm at Air Canada Center and Sunday at 3 pm at Ricoh Coliseum. 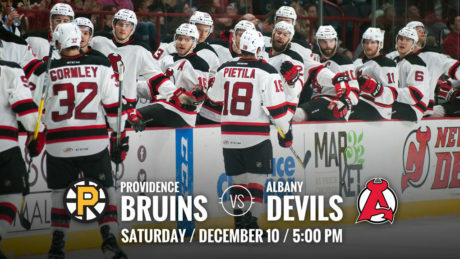 The Devils return to Times Union Center Saturday for a 5 pm puck drop against the Bruins. 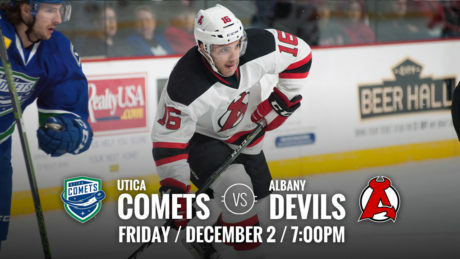 The Devils put their five-game home winning streak on the line Friday when they host the Utica Comets for a 7 pm affair at Times Union Center. 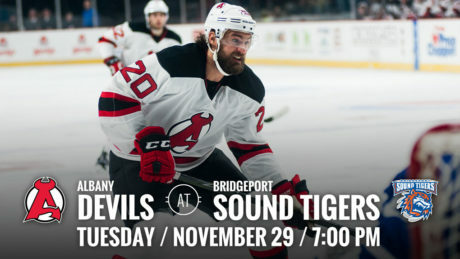 The Devils and Sound Tigers are both trending up with their recent play. 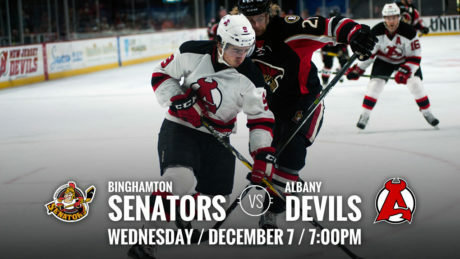 The two teams square off Tuesday at 7 pm at Webster Bank Arena. 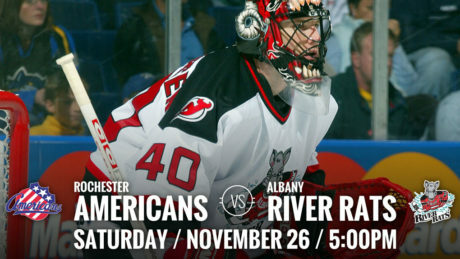 Having notched a 4-3, come-from-behind, road victory Friday, the River Rats return to Times Union Center Saturday for a 5 pm contest against the Americans. 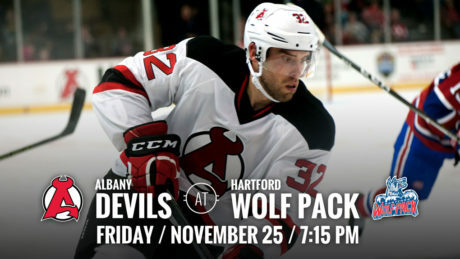 In a post-Thanksgiving matchup, the Albany Devils travel to face the Hartford Wolf Pack Friday at 7:15 pm at XL Center. 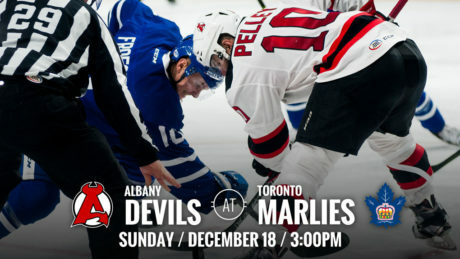 After playing five of their last seven games on the road, the Devils return to the Times Union Center for a 7 pm contest against the Marlies Tuesday. 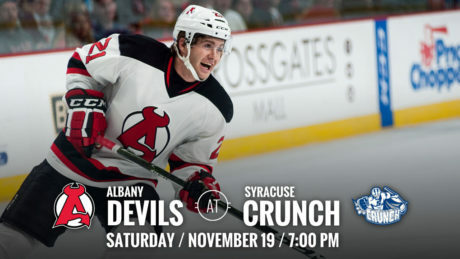 Having short memories will be required for both the Albany Devils and the Syracuse Crunch for their 7 pm matchup Saturday at the War Memorial at Oncenter. 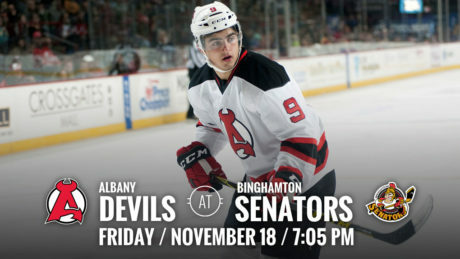 Riding a three-game winning streak, the Albany Devils travel to face the Binghamton Senators Friday at 7:05 pm. 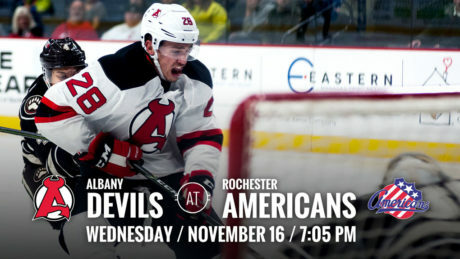 Coming off back-to-back home wins, the Devils travel to face the Americans Wednesday at 7:05 pm at Blue Cross Arena.